Many of us work from home these days, and the classic, traditional home office with an imposing desk and plenty of natural light is the dream. But there is more to looking for traditional home office design ideas than just picking a beautiful desk, especially in small homes or those with an open plan layout. So, we're here to guide you towards creative home office design solutions for all kinds of rooms and homes that will still look perfect in a traditional home. For more practical know-how, find out how to design a home office in our comprehensive guide. What is the easiest way to add personality to your home office? Creating a gallery wall. In fact, the home office is the space where a gallery wall makes a lot of sense, since you are likely to spend a lot of time looking at it. To maintain a traditional look, pay attention to frames, picking ornate rather than plain ones. Need more tips? Find out how to hang a gallery wall. The desk is by far the most important and visible piece of furniture in your home office, even more so when it's part of a traditional design scheme. This is your opportunity to invest in a really gorgeous piece of furniture with a history. The antique desk in this home office is an old barrister's desk. You can, of course, buy a new desk with a more traditional look – check out our best modern office desks. Not all homes have a separate room for a home office; if space is limited, think creatively about where in your home might be suitable for a work space. You don't necessarily need lots of room, but natural light is a must. This study space on a landing benefits from lots of daylight coming through the window. Find more traditional hallway design ideas in our gallery. A traditional design scheme doesn't have to adhere to any one period, so feel free to mix and match furniture from different eras. This home office cleverly juxtaposes antique and Mid-century furniture and accessories. If it is authentic home office design ideas you're after, find out how to create a Mid-century modern home office in our guide. Live in a period home, but want to experiment with a more contemporary look? The home office is the easiest room to achieve a nice balance between classic and contemporary. This home office, for instance, combines contemporary furniture with the more traditional pieces, while the upholstered chair gives the room an air of comfort and a splash of colour. If space is really limited, you may well be able to create a decent study space in the corner of a living room or bedroom. Always position your desk in the corner closest to the window. In the bedroom, this small desk is placed in a nook in the corner of Claire Baker's bedroom in her late-Victorian terraced villa in County Durham. Dining rooms and kitchen diners also provide plenty of opportunities for creating a work space. Our advice is to create a designated area in the dining room that isn't used much for serving food (so that you don't have to clear the table every time you want to do work). This kitchen features a dedicated workspace that's perfect for someone who mainly works from a laptop. Bench seating with lift up lids provides a handy place to stash away paperwork and office equipment when it's not in use. If your home is open plan, you might have to combine living space, dining space, and work space. The way to make it work? Go for a large, multi-tasking table. Then, find out more about creating an open plan layout. If you work from home, but the kind of work you do requires an artist's studio rather than a home office per se, you'll still need to consider access to natural light and how much furniture you'll need. If you'll be standing up for long periods of time, consider getting a comfortable armchair to relax in when you take a break. Have a look at our pick of the best armchairs for inspiration. This study space is probably one of the tiniest we've seen, but it really makes the most of the natural light coming from the skylight, and the painted chair adds design pizzazz. To create a similar upcycled accent piece, find out how to paint furniture in our guide. Bureaux are the perfect pieces of furniture for study spaces that don't have their own dedicated room. Storage and writing desk in one, this bureau fits seamlessly into a living room design scheme. Got space for a bit more storage? We have lots more home office storage ideas. If you've taken a lot of time putting together your traditional living room design, you'll want your work space to integrate perfectly and not disrupt the overall look. Consider a bespoke fitted solution that will be sympathetic to the rest of the room, or choose a small half-moon table, like this one to make room for a traditional home office in a small living room. We have more lovely traditional living room design ideas for your to browse. Love this look? See more inspiring spots for book lovers. The right lamp can make all the difference in the home office. In a traditional design scheme, choose classic, Mid-century task lamps or vintage side lamps. Pair with pale toned botanical wallpaper to help clam and focus the mind. And take a look at our pick of the best home office accessories. South-facing rooms are ideal for many purposes, but the home office is actually not one of them. Direct sunlight and heat can be a problem, so you'll need to invest in a good window treatment. Shutters will look great as well as protecting you from the elements. Check out more home office window treatment ideas. Dark and moody decorating schemes are in, but an all-dark design scheme might be too much for a home office (just think about trying to focus in a very dark room on Monday morning). So, instead pick a mid-toned neutral that will give the room a calming, inviting appeal, without starving it of natural light. 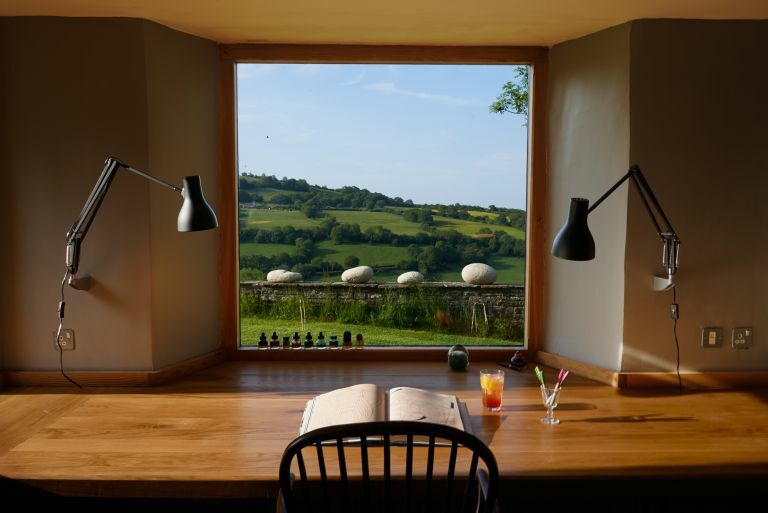 Ensure the window itself remains uncluttered to allow as much daylight as possible in, and plan your home office lighting well to ensure you can work when days are shorter. Set on a dark room scheme? We have lots of dark and atmospheric decorating ideas for you to consider. If you have space under the stairs, you might well have room for a study space; in some cases, the understair space is large enough to accommodate a fully-fledged home office, as in this bespoke space via @myhouseidea. To keep the decorating scheme traditional, stick to wood and leather as your main materials; in a cottage, pick lighter finishes as below to make the space feel bright and spacious. Wondering what else that space under the stairs might be good for? Check out our gallery of understair storage solutions. Guess the colour that's been scientifically proven to improve concentration and creativity? It's orange. Which is just as well, given how gorgeous it can look when paired with traditional home office furniture. If you prefer a more casual look, or if your home office is part of a boho home decor scheme, go for lighter, slimmer furniture. This home office looks charming and quirky thanks to the painted console table and folding chair. If your work requires you to consult a lot of reference material, or you use a traditional filing system, invest in a desk with storage. This will allow you to avoid cluttering your office space with filing cabinets. See our favourite home office storage ideas. If you're tight on space, or can only invest in one good piece of home office furniture, an armoire will cover all your needs, from desk space to storage. The New England home office armoire from The Dormy House looks great, too, and can come in a paint finish of your choice. If your home office is spacious, facing the desk into the room can give a feeling of grandeur. If you do take this route, you'll need to plan the wiring carefully to ensure that no ugly wires trail down the back of the desk or across the room to the nearest wall. The window treatments need to be carefully thought out, too, to ensure that you don't suffer from glare on a computer screen. 22. Looking for traditional home office ideas for a garden room? If your home office is in a garden room, you can really go to town with an idiosyncratic decorating scheme, incorporating a light industrial or gardener's theme into it. Pick upcycled furniture that's comfortable and and pretty and invest in good lighting and – of course – heating to ensure your room is welcoming all year round. Find out how to plan a garden room in our guide. Want more fabulous traditional design ideas?